Louisville Collegiate School opened its doors on September 23, 1915 in a house on West Ormsby Avenue in Old Louisville, becoming the first school in Kentucky committed specifically to preparing young women for college. The Collegiate community celebrated its first graduation in 1917, the same year that the school’s official crest was first printed. Needing more land to accommodate growing enrollment, Collegiate moved in 1927 to its current home on Glenmary Avenue in the historic Cherokee Triangle, just east of downtown Louisville. Throughout Collegiate’s early decades, the school intermittently experimented with enrolling small numbers of boys in the primary grades. The Lower School eventually committed to a fully coeducational program in 1973. In 1980, Collegiate’s Upper School became coeducational. Today, the school is nearly balanced in its number of enrolled boys and girls, and in this year marking Louisville Collegiate School’s centennial, just over 700 students are enrolled in grades JK-12. Collegiate’s small size offers students opportunities for active participation in the life of the school. In recent years, Collegiate has continued its proud tradition of academic excellence by establishing new and innovative programming. In 2006, the school established Kentucky’s only Chinese language program for grades 6-12 on a single campus by signing a Memorandum of Understanding with the schools of Jiujiang, China to establish annual student exchanges. In 2008, the school opened a Junior Kindergarten, becoming the only National Association for the Education of Young Children (NAEYC) accredited program in Louisville attached to a K-12 school. In a continuing spirit of innovation, Collegiate opened its makerspace, The Makery, at the beginning of the 2014-15 school year. 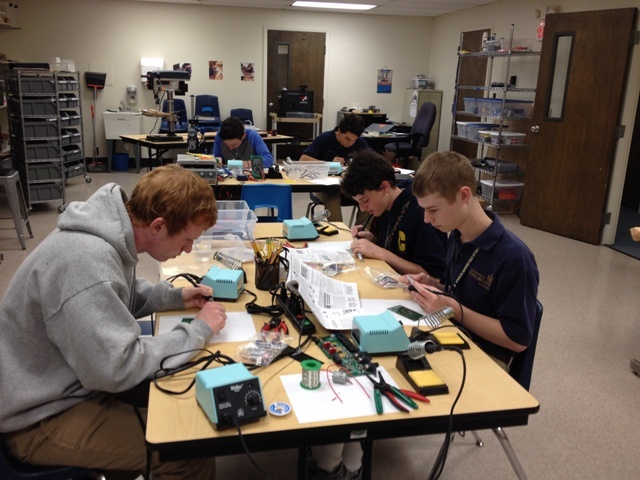 Maker Portfolio students learn to solder. Collegiate’s makerspace, The Makery, is located in the basement of our Fine Arts building, and is equipped for light woodworking and metalworking, 3-D printing, laser cutting and more. The physical space is a repurposed Art room, measuring approximately 20 by 35 feet. In a niche along one wall are four adjustable shelves, 14 feet long by two feet deep. These shelves hold student projects, cleaning supplies, a first aid kit, and eight laptop computers. The Makery was furnished with flexibility and portability in mind. With the exception of a floor-standing band saw and a laser cutter that must remain tethered to its exhaust duct, all Makery fixtures and tools are portable–either on wheels or small enough to be carried from one place to another. The Makery’s two 48-inch “baker’s rack” shelving units and its two bin racks for consumables are on wheels; hand tools are stored in a rolling tool chest; workbenches (2) are intentionally small and lightweight; the four work tables fold, and can be moved easily, or even removed from the space entirely; Twenty chairs and eight stools are stackable. The Makery’s current tool inventory includes the usual hand tools (hammers, saws, chisels, screwdrivers, hex wrenches, pliers, etc. ), two cordless drills, one corded drill, one jigsaw, one Dremel rotary tool with accessories, an assortment of electronics tools such as wire strippers and cutters, two benchtop drill presses with vises, two scroll saws, a grinder, a 14-inch band saw, a 12-inch miter saw, a MakerBot Replicator 2 3-D printer, a Full Spectrum 40-watt laser cutter, seven Weller soldering stations and an assortment of pencil soldering irons, a variable voltage power supply, multimeters, breadboards and jumpers, a sewing machine, hot glue guns, clamps of all shapes and sizes, brooms, dustpans, and a vacuum cleaner. Safety equipment includes protective glasses, specialized fire extinguishers, and a first-aid kit. Cotton gloves, leather gloves, and nitrile gloves are available, as well. Consumables include wood glue, hot glue sticks, sandpaper, steel wool, various fasteners, various kinds of tape, pipe cleaners, craft sticks, sharpies, zip ties, paint, steel wire, copper wire, solder, rubber bands, and an ample supply of building materials (dimension lumber, plywood, dowels, sheet acrylic, cardboard, hardware, etc.). Other consumables are ordered as projects require them. Collegiate created The Makery as a collaborative space for hands-on experimenting, designing, building and inventing. Our goal is to let students, teachers, and the larger Collegiate family discover (or rediscover) resourcefulness, self-reliance, and the courage to try and fail–then try again. Our hope is that our young makers will become stronger critical thinkers, intelligent designers, resilient risk takers, and confident problem solvers. We want to get students excited about learning. The Makery supports curricular initiatives at many levels, JK – 12 and in this first year serves as the primary workspace for Upper School students enrolled in the Maker Portfolio Lab and Engineering Design courses. Additionally, eighth-grade c.school, our Middle School design thinking initiative, uses The Makery for experimentation and prototyping. The Makery is the central workshop for certain interim and science projects, as well. Development of new programs is ongoing. This unique elective infuses art, technology, engineering, math and science into a hands-on laboratory that will utilize Collegiate’s makerspace to create build projects for students’ maker portfolios. Through the makerspace students will have access to programming software, a laser cutter for design and fabrication, a vinyl cutter, a 3D printer, and an electronics workbench. This is a semester course that will be offered both semesters and may be taken more than once. This is an interdisciplinary elective with a pass/fail grading system. The course is open to all 9th- 12th students willing to create, explore, and fail during the process. Other than safety there are no parameters for the students’ creations. This course is an introduction to topics of Engineering, similar to the lab component of a college level introduction to Engineering course. Students will work in teams to design and construct devices to accomplish a specific task based on applying material introduced in this course and their previous science courses. Although a science elective, this course will include aspects of mathematics, art, design, technology and engineering. Notably, this course will provide support for competitions such as the Science Olympiad build projects and the Real World Design Challenge (RWDC) scholarship competition. A large portion of this course will take place in Collegiate’s makerspace, affording students access to programming software, a laser cutter, a 3D printer, and an electronics workbench. This one-semester course will be offered both semesters. Projects will differ between semesters, so that a student may take the course both semesters. Prerequisite: Biology and Chemistry. Physics must be taken concurrently if not previously completed. Who comes to The Makery? Students in grades JK through 12. Students may come for an occasional class tour or one-time project, for an enrichment activity, for an initiative such as design thinking, for Maker Portfolio or Engineering Design class, or individually–to complete a project, or to tinker. Things students and teachers have made: Birdhouses in the style of Piet Mondrian paintings; laser-cut gears; electronic circuits; Science Olympiad plane, car, bridge, and Mission Possible structure; magic c.sticks; 3-D printed engineering prototypes; a license plate ukulele; a laser-cut “cigar box” guitar; minecraft chests; Nerdy Derby race cars; a spot welder hacked from a microwave transformer; a Kinect-powered sound and light sensory chamber; a laser-cut tessellation table inlay; laser-etched nameplates; an acrylic computer tower; geoboards; penny boards; wire sculptures; cedar art sculptures; a catapult; a 3-D printed game console enclosure; Inkscape, Sketchup and AutoCad drawings; Acrylic laser-etched coasters; water wheels; a laser-cut dice tower; and design thinking prototypes too numerous to list. Things students and teachers have “unmade”: We enjoy taking things apart. Our boneyard of old electronics and small appliances allows students an opportunity to tinker with tools, and to explore the way things are put together and how they work. The Makery works with teachers in all grades to discover new ways in which the tools and programs in the makerspace can enhance learning and, wherever possible, link to elements of the curriculum. 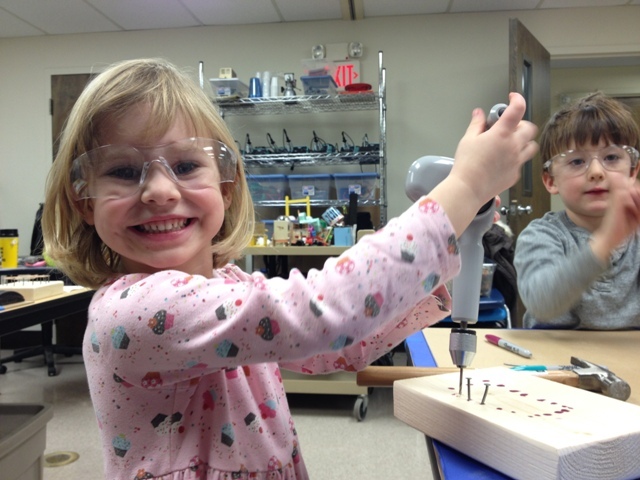 (Junior Kindergartners are our most enthusiastic makers!) Going forward, we will expand The Makery’s program to include select after-school programs and summer camps. For example, this summer, campers will build Little Free Libraries. Fall 2015, The Makery will host a Saturday morning STEM class for girls in grades 5 through 8, made possible by a generous Making the Future grant from Cognizant Technology Solutions (http://cogniz.at/MTF_STEM). The Makery also seeks to include individuals and groups from the larger community, partnering with select local schools, and with residents of Collegiate’s surrounding neighborhood. As we discover new learning opportunities and increase our number of class visits, we will certainly outgrow The Makery’s current physical space. Plans are already underway to create a new, larger makerspace as part of our current capital campaign. We installed a Halotron fire extinguisher specifically for laser cutter fire suppression. Additionally, there is a chemical fire extinguisher in the hall just outside The Makery entrance. The Makery room had six pre-existing duplex floor outlets spaced ten feet apart. In addition, we installed plugmold on three walls (under both of the whiteboards and behind the laser cutter) to make workspace arrangement and tool placement more flexible. Each run of plugmold has its own 20-amp breaker. Plugmold outlets are spaced 12 inches apart. We do not run the 12-inch miter saw inside The Makery, because it creates too much dust. And because of safety concerns, we do not allow students to use the miter saw.